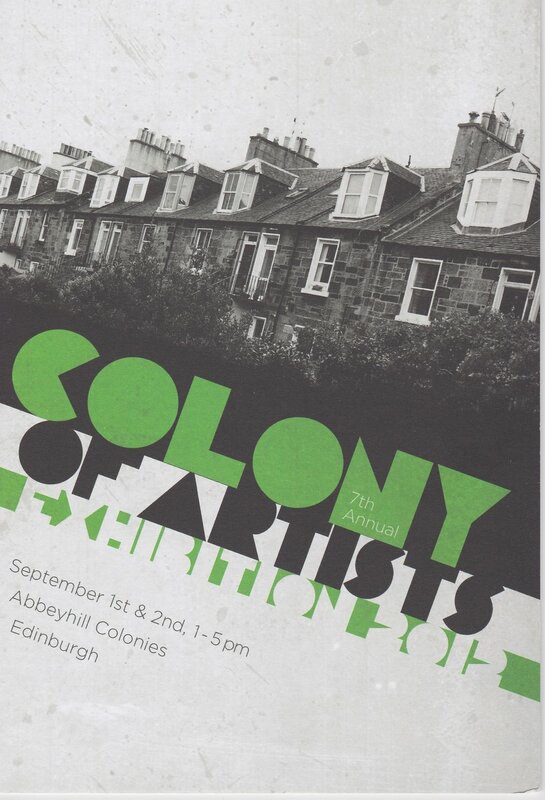 After many years exhibiting at the well known Pittenweem Art Festival in Fife, Gill Smith who is a resident artist of the Abbeyhill Colonies, wondered if the festival could be replicated in some way in the streets of the Abbeyhill Colonies. 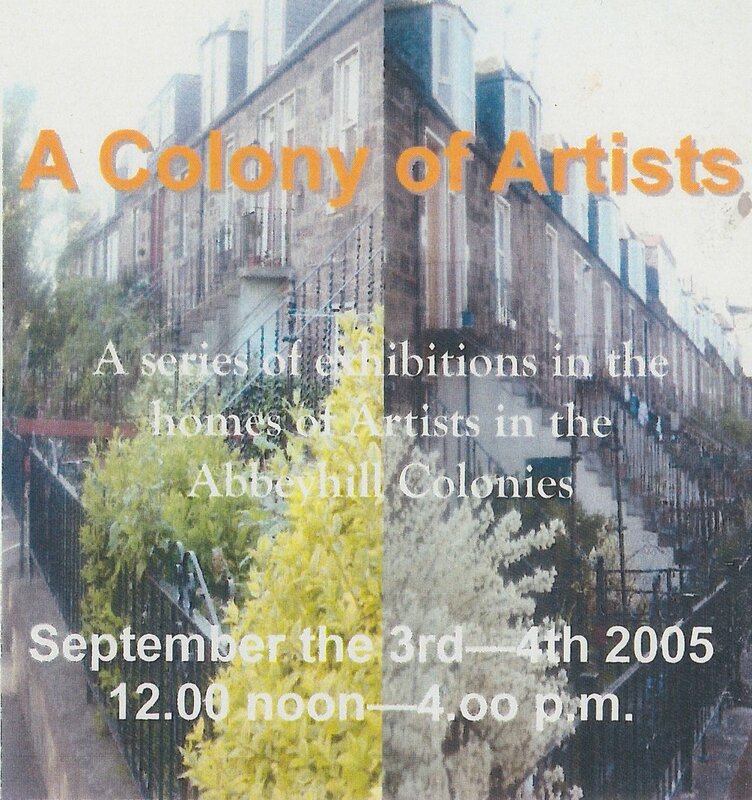 A meeting was then held in a local pub with the artists that had responded to the leaflet and the Abbeyhill Colony of Artists was formed with 9 artists committed to the event. There are 3 founding members still involved to this day in the exhibition, Gill, William Mazur and Anne-Marie Duffin who organises a tea tent in her garden selling homemade baking for charity..
Gill, along with her partner Bob Giulianotti organised the first few years of the COA exhibitions with William Mazur and his wife Kat Chisholm organising the event since then. Edinburgh and beyond come to visit. We also would like to recognise those that have brought the event to where it is today as without them the exhibition may not have continued. It’s important to realise that the exhibition has survived due to the strong concept of community that still exists in our wee streets and the fact that artists now flock to live in a community of like-minded people which continues to strengthen the bonds of our community. 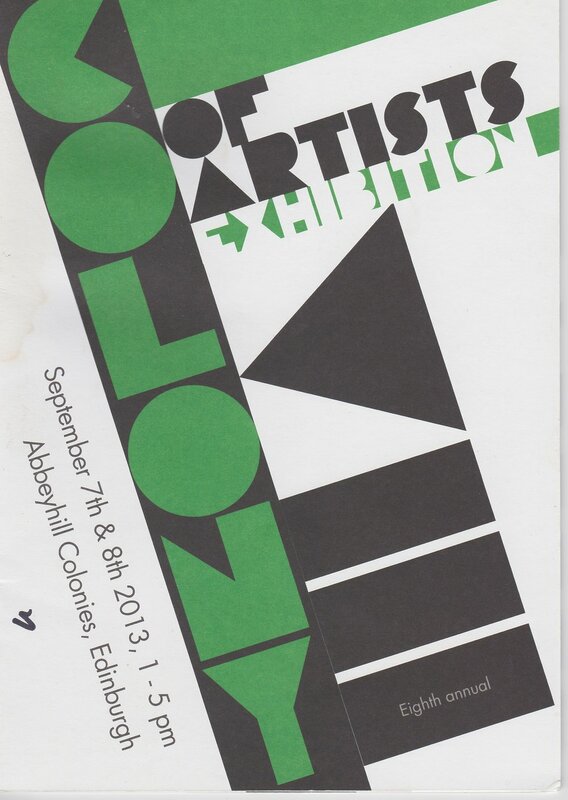 2005 – First Colony of Artists Exhibition organised by Gill Smith and Bob Giulianotti. Bob also designed our first brochure. 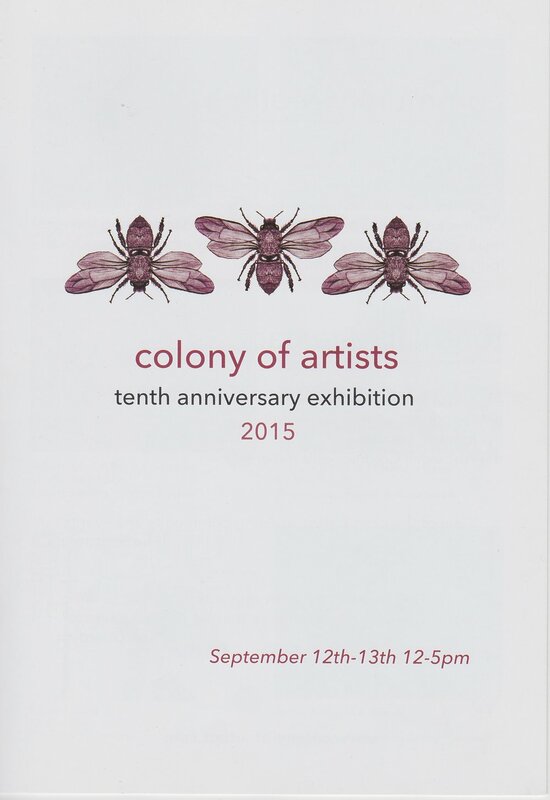 9 artists participated with an introduction written by Jo McSween. 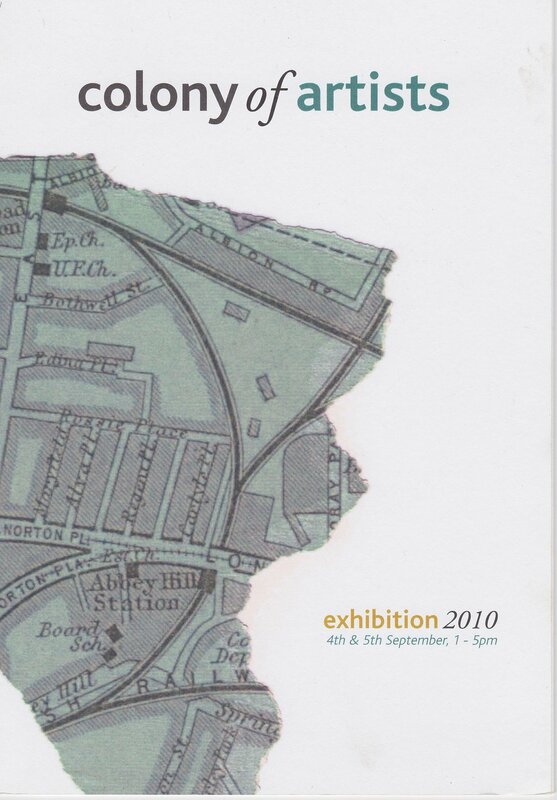 2008 – after a year off to reflect on the direction of the exhibition the 2008 exhibition was organised by Bob Giulianotti, William Mazur and Gill Smith. Once again Bob designed the brochure. In order to involve more of the community this was the first year that the Abbeyhill Primary School participated. A huge leap in artist participation as well - 24! 2009 – Some new faces with the event being organised by Denise Horn, William Mazur, Debbie Phillips and Kat Chisholm. Brochure design by Bob Giulianotti. 25 Artists participated. The Scotsman described the event as "the city's answer to South Bank". 2011 – Organised by William Mazur, Debbie Phillips, and Kat Chisholm. Brochure design by Michele D’Elia and Sean Ó Cathasaigh. 24 Artists participated. 2013 – organised by Denis Mallon, William Mazur and Kat Chisholm. Brochure Design by Denis Mallon. 30 artists particpated - our largest participation to date! This was the first year that local businesses took part and the first year that we had window displays at Manna House Bakery and Cornelius Beer and Wine on Easter Road designed by Lisa Mallon. Organised by Nic Souter, Kat Chisholm, William Mazur, Luke Isbel, Illie Nedkova, Clare McCrory. 10 th Anniversary Brochure Design: David Barrington. 41 Artists participated – our biggest exhibition to date! We needed to do something very special for our 10th Exhibition and our theme for 2010 was to celebrate the people who came before us and made the Colonies what they are today. With this in mind the local history exhibit was expanded with Kat Chisholm taking on the task of researching the local area to begin a local residents photo archive. Hilary Burwell formally interviewed two of the oldest residents in the Colonies, Jackie Sewell and Peter Shaw, to record their stories of old Abbeyhill. Recordings of their interviews were available at the local history exhibit. The Singing Street, a film made by local teachers at Norton Park School, was screened during the exhibition as well which has proved a very popular yearly event. We were incredibly lucky to have Professor Richard Rodger, a Professor of Economic and Social History at Edinburgh University and an Colonies expert, give a lecture at Abbeyhill Primary School on the history of the area - we only wished we had filmed it! To involve more of the local community, and provide something new, we set up The Hive Music Venue, with music organised by Betty Pottinger, at Holland House on Rossie Place. This was a great success and with the support of Holland House Electrical Company we've been able to continue with The Hive each year since then. 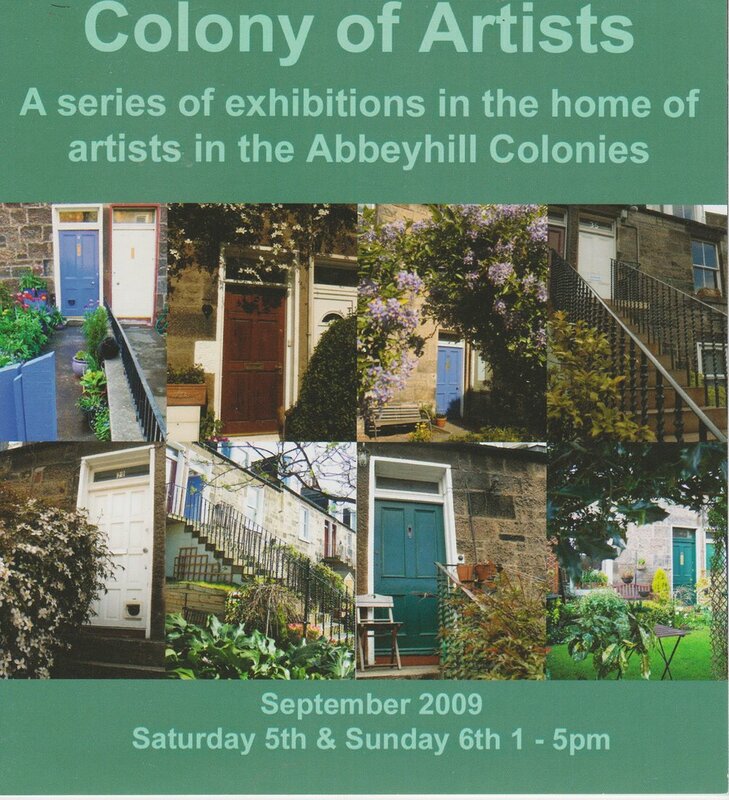 Lastly, in 2010 we formally constituted the Colony of Artists as we begun to look ahead at how we could continue to grow the event and we held the first COA Raffle to raise funds to keep the event going. Organised by Nic Souter, Kat Chisholm, William Mazur, David Barrington, Illie Nedkova, and Clare McCrory. Brochure Design: David Barrington. 57 artists participated. Due to production issues at Stewarts Brewery COA Festival Ale teamed up with Campervan Brewery based in Leith to brew COA 2016 Ale. Paul Gibson, who runs the brewery, was instrumental in getting out beer out to more outlets and spreading the love! 2006 – organised by Gill Smith and Bob Giulianotti with our brochure design by Alastair Clark. A few more artists this year, with 12 artists participating. 2010 – the event was beginning to get more attention through word of mouth and increased media attention. The 2010 exhibition was organised by William Mazur, Debbie Phillips, and Kat Chisholm. Brochure design by Michele D’Elia and Sean Ó Cathasaigh. 27 artists participated. First year that the ever popular bunting was made and put up by William Mazur for the event! Our first national newspaper coverage with The Guardian writing a very lovely article and video about the event. 2012 – Organised by William Mazur, Denis Mallon and Kat Chisholm. Brochure design by Denis Mallon. 27 artists participated. Social Media pages created for the first time allowing us to reach more people. 2014 – Organised by Kate Allberry, Luke Isbel, William Mazur and Kat Chisholm. Brochure Design by David Barrington. 28 artists participated. We continued our business involvement with Kate Allberry designing tiny window bunting to involve more local shops. This has proved very popular and increased support of all the businesses in the area. With the event becoming more popular it seemed a good idea to celebrate the history of the area and Hilary Burwell curated the first local History exhibit attracting huge numbers. We always enjoyed the support of James Wrobel, owner of Cornelius Beer and Wine on Easter Road, and with his help we had the first ever COA beer brewed and bottled by Stewart Brewing. A collectors item no doubt!! The Abbeyhill Primary School continued it's arts program with the first ever artist-in-residence: Aileen Paterson, Maisie of Morningside author. Samuel Macro, and Hannah Coleman. Brochure Design: David Barrington. 55 Artists particiapted. We expanded our offering at the Hive Stage with onsite beer sales direct from Campervan Brewery's vintage VW! The Hive musical line-up was entirely organised by Simon Illingworth from the Safari Lounge on Cadzow Place.